The aim of this study was to investigate whether serotonin (5-hydroxytryptamine, 5-HT) can modulate Na+/K+ pump in rat hippocampal CA1 pyramidal neurons. 5-HT (0.1, 1 mM) showed Na+/K+ pump current (Ip) densities of 0.40 ± 0.04, 0.34 ± 0.03 pA/pF contrast to 0.63 ± 0.04 pA/pF of the control of 0.5 mM strophanthidin (Str), demonstrating 5-HT-induced inhibition of Ip in a dose-dependent manner in hippocampal CA1 pyramidal neurons. The effect was partly attenuated by ondasetron, a 5-HT3 receptor (5-HT3R) antagonist, not by WAY100635, a 5-HT1AR antagonist, while 1-(3-Chlorophenyl) biguanide hydrochloride (m-CPBG), a 5-HT3R specific agonist, mimicked the effect of 5-HT on Ip. 5-HT inhibits neuronal Na+/K+ pump activity via 5-HT3R in rat hippocampal CA1 pyramidal neurons. This discloses novel mechanisms for the function of 5-HT in learning and memory, which may be a useful target to benefit these patients with cognitive disorder. 5-HT, as a neurotransmitter or neuromodulator in the central nervous system, plays a critical role in the control of blood pressure, body temperature, sleep, depression, anxiety, epilepsy [1–4]. Additionally, the modulation of the serotonergic system affects long-term potentiation (LTP) and long-term depression (LTD), the likely neurophysiologic derivates of learning and memory formation, which has been involved in the treatment of Alzheimer's disease [5–8]. Some studies demonstrate that 5-HT1AR-knockout animals show a deficit in hippocampal-dependent learning and memory, such as the hidden platform (spatial) version of the Morris water maze and the delayed version of the Y maze , while the stimulation of 5-HT1AR mediates enhancement of LTP  and prevents the impairment of learning and memory [11, 12]. Therefore, the stimulation of 5-HT1AR may be useful in the symptomatic treatment of human memory disturbances. However, accumulated clinical reports support that the injection of 5-HT3R antagonists facilitates the induction of LTP, and enhances the retention and consolidation of memory in hippocampal dependent tasks [13–15]. These clinical application of 5-HT3R antagonists have been found to improve memory in schizophrenic or Alzheimer demented patients [16, 17]. Therefore, 5-HT3R also plays a critical role in cognitive function. In addition to increasing neuronal excitability , inhibition of Na+/K+ pump activity can induce LTD whereas depotentiate LTP , and then cause impairment of learning and memory and amnesia [20, 21]. Herein, in the present study, we investigate if a relationship occurs between 5-HT and Na+/K+ pump in hippocampal CA1 pyramidal neurons, which may provide new insights in the mechanisms responsible for the 5-HT-mediated modulation of learning and memory. 0.5 mM Str often did not recover completely in hippocampal CA1 slices even after prolonged washout in the present study, consistent with the previous study that Na+/K+ pump inhibition by Str was effectively irreversible . Furthermore, 10 μM Str did not recover completely in rat ventral midbrain slices . Therefore, Str perfusion was applied one time in one brain slice. In the present study, Ip densities affected by 5-HT (0.1, 1 mM) were 0.40 ± 0.04, 0.34 ± 0.03 pA/pF contrast to 0.63 ± 0.04 pA/pF of the control of 0.5 mM Str (Figure 1), demonstrating 5-HT inhibits Na+/K+ pump activity in hippocampal CA1 pyramidal neurons. Some studies have reported that 5-HT inhibits Na+/K+ pump in T sensory neurons of the leech  and kidney , then depresses the after-hyperpolarization. However, other studies have showed that 5-HT activates glial Na+/K+ pump activity in rat cerebral cortex and hippocampus [26, 27]. 5-HT stimulated synaptic membrane Na+/K+ pump from the rabbit cerebrum, but did not influence the activity of this enzyme in the other brain regions . These studies suggested that the regulation of 5-HT-induced Na+/K+ pump activity may be attributable to tissue and cell specificity. 5-HT-mediated inhibiton of Ip in rat hippocampal CA1 pyramidal neurons. (A) The representative tracings of 5-HT (0.01-1 mM)-mediated effect of Ip contrast with the control of Str-mediated Ip. 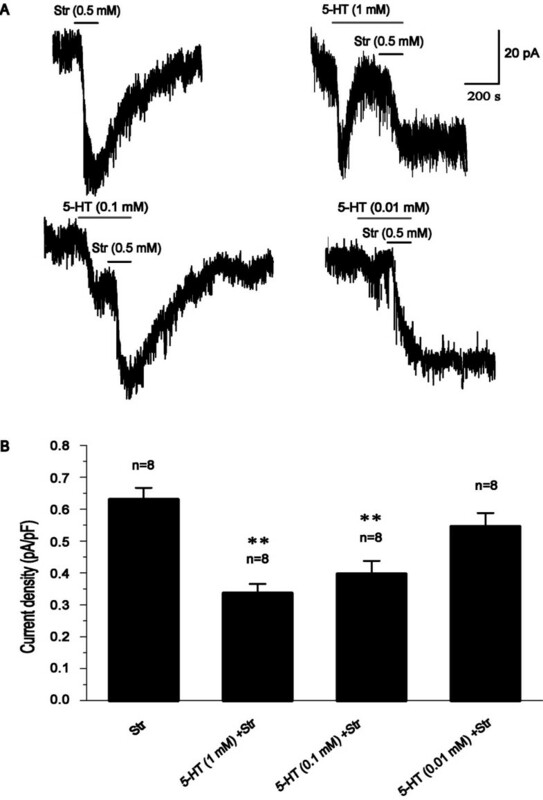 (B) 5-HT at 0.1 and 1 mM significantly mediated concentration-dependent suppression of Ip contrast with the control of Str (0.5 mM) (**P < 0.01). The number of all cells tested is indicated in each column. Furthermore, some studies reported that the application of 1 μM 5-HT prevented depotentiation but not LTP induced by high-frequency stimulation, whereas bath application of 100 μM 5-HT blocked the induction of tetanus-induced LTP , consistent with the previous study that 5-HT (30 μM) prevented LTP induced by a primed burst in rat hippocampal CA1 region . Accordingly, different concentrations of 5-HT may have different modulation of learning and memory. Moreover, the inhibition of Na+/K+ pump activity can induce LTD whereas depotentiate LTP , and then cause impairment of learning and memory and amnesia [20, 21]. Herein, in the present study, 5-HT-mediated inhibition of Na+/K+ pump activity may disclose novel mechanisms in learning and memory. Further studies should be done to explore the mechanism. To identify the specific 5-HTR involved in the regulation of Ip, we focused on the 5-HT1AR and 5-HT3R that are abundant in all hippocampal layers and subregions [31–33]. In the present study, "WAY1000635 (a 5-HT1AR antagonist) + 5-HT + Str" treatment yielded the similar result as "5-HT + Str" treatment (Figure 2), i.e., the application of the antagonist for 5-HT1AR had no effect on 5-HT-mediated inhibition of Ip, suggesting that 5-HT1AR was not involved in 5-HT-mediated inhibition of Ip. Some studies have reported that 5-HT1AR mediates enhancement of LTP in hippocampal dentate gyrus  and prevents the impairment of learning and memory [11, 12], whereas inhibits LTP in the hippocampal CA1 field and visual cortex [34, 35], demonstrating the different effects of 5-HT1AR on synaptic transmission in different tissues. Therefore, there still are some arguments about 5-HT1AR-induced-modulation of LTP. In the present study, 5-HT1AR did not antagonize 5-HT-mediated inhibition of Ip, demonstrating that Na+/K+ pump may be not involved in 5-HT1AR-mediated modulation of memory. 5-HT-mediated inhibiton of Ip is mediated by 5-HT 3 R, but not by 5-HT 1A R in hippocampus. (A) The representative tracing of 0.5 mM Str- mediated Ip in the control. (B) The representative tracing of 5-HT (0.1 mM) -mediated inhibiton of Ip. WAY100635, a 5-HT1AR antagonist, alone did not affect Ip (P > 0.05) (C), and did not block 5-HT-mediated inhibiton of Ip (D). Ondasetron, a 5-HT3R antagonist, alone did not affect Ip (P > 0.05) (E), whereas attenuated 5-HT-mediated inhibiton of Ip (F). (G) 5-HT-mediated inhibiton of Ip is blocked by ondasetron, but not WAY100635. (H) The representative tracing of m-CPBG (0.1 mM)-mediated inhibiton of Ip. (I) m-CPBG (0.1 mM) -mediated inhibiton of Ip. Values significantly different by Student's t-test from results are indicated as **P < 0.01. In the presence of ondasetron, a 5-HT3R antagonist, 5-HT-mediated inhibition of Ip was blocked from 0.40 ± 0.04 to 0.61 ± 0.04 pA/pF (Figure 2), while m-CPBG, a 5-HT3R specific agonist, mimicked the effect of 5-HT on Ip (Figure 2). These results show, for the first time, that the inhibition of 5-HT-mediated Ip is primarily mediated by 5-HT3R in hippocampal CA1 pyramidal neurons. On the subcellular level, both presynaptic and postsynaptic 5-HT3R can be found. Presynaptic 5-HT3R is involved in mediating or modulating neurotransmitter release. Postsynaptic 5-HT3R is preferentially expressed on interneurons [36, 37], and there is also 5-HT3R in postsynaptic pyramidal neurons [38–42]. For example, electrophysiological studies in postsynaptic pyramidal neurons in the hippocampal CAl region or hippocampal primary cultures showed the activation of 5-HT3R [38–42]. Furthermore, 5-HT3R is a unique serotonin receptor as it acts as a ligand-gated ion channel, whereas all the other types of serotonin receptors belong to the G protein-coupled receptor superfamily, which may be the reason of 5-HT3R, rather than 5-HT1AR, is the relevant 5-HTR for 5-HT-mediated inhibition of Ip in the present study. This still deserves further investigations. Some studies indicate that overexpression of the 5-HT3R in mouse forebrain results in enhanced hippocampal-dependent learning and attention involved in fear conditioning , whereas most reports show that 5-HT3R antagonists can facilitate LTP and enhance the retention and consolidation of memory in hippocampal dependent tasks . Furthermore, the complete abolishment of 5-HT innervation in the hippocampus increases LTP in vivo -which would suggest that, on balance, 5-HT may exert a negative influence on LTP via 5-HT3R and then impair learning and memory [14, 15]. Clinically application of 5-HT3R antagonists have been found to improve memory in schizophrenic or Alzheimer demented patients [16, 17]. It is, however, not clear whether this effect is specific to LTP, or secondary to other changes. Some studies reported that inhibition of Na+/K+ pump activity can induce LTD whereas depotentiate LTP , and then cause impairment of learning and memory and amnesia [19–21, 45–47]. Moreover, The initial stationary phase of the LTP was followed by a decrease in Na+/K+ pump activity of neurons and an augmentation of Na+/K+ pump activity in the glial cells . These studies supported that there may be some relationship between Na+/K+ pump and LTP. The present results show that 5-HT can suppress Ip in hippocampal CA1 pyramidal neurons via 5-HT3R, consistent with the previous study that 5-HT3R partly mediated the decrease of Na+/K+ pump activity induced by cocaine in neuronal-like cells , suggesting that inhibition of Na+/K+ pump activity may be involved in 5-HT3R-induced modulation of learning and memory. This provides new insights for the possible synaptic role of 5-HT via 5-HT3R in cognitive function and neuronal development through Na+/K+ pump, which may be a useful target to benefit these patients with cognitive disorder. 5-HT inhibits neuronal Na+/K+ pump activity via 5-HT3R in hippocampal CA1 pyramidal neurons, which may disclose novel mechanisms for the function of 5-HT in learning and memory. Str, ondasetron and WAY-100635 were purchased from Sigma (St. Louis, MO, USA). 5-HT and tetrodotoxin (TTX) were purchased from Alexis (San Diego, CA, USA). m-CPBG and other chemicals were purchased from Alfa Aesar (Ward Hill, MA, USA). Str was dissolved in DMSO and further diluted 1: 1000 in artificial cerebrospinal fluid (ACSF) containing (mM): NaCl 119, KCl 5.4, MgCl2 1.3, NaH2PO4•2H2O 1, D-Glucose 11, NaHCO3 26.2, CaCl2 2.5. Control solutions of 1: 1000 DMSO had no effect on membrane current. TTX was dissolved in dilute acetic acid (PH 4.8-4.9). 5-HT, ondasetron, m-CPBG and WAY-100635 were dissolved in sterile water and stored as stock solutions. All stock solutions were stored as frozen aliquots at -20°C. Sprague-Dawley rats of 12-14 days were deeply anesthetized with sodium pentobarbital (45 mg kg-1, i.p.) and then rapidly decapitated. Our experiments were approved by Animal Care Committee of Hebei Medical University. Appropriate experimental procedures were taken to minimize pain or discomfort. The brain was quickly removed from the skull and transverse hippocampal slices (300 μm thick) were obtained by cutting with a vibroslice MA752 (Campden Instruments, Loughborough, UK) in ice-cold ACSF well-saturated with 95% O2 and 5% CO2 (PH 7.3-7.4). These slices were pre-incubated in oxygenated ACSF at room temperature (22-25°C) for 1 h.
The hippocampal slice containing CA1 pyramidal neurons was transferred to a submerged recording chamber and continuously superfused with oxygenated ACSF (containing 2 mM BaCl2, 0.2 mM CdCl2 and 0.5 μM TTX) at a rate of 2 ml•min-1 at room temperature . Only one cell was measured from each brain slice. Hippocampal CA1 pyramidal neurons were visualized by their location [51, 52] using infrared differential interference contrast video microscopy and a ×40 water immersion lens (Zeiss Axioskop), as shown in Figure 3A, B, C. In addition to the discrimination by the location, we determined pyramidal neurons by electrophysiological characteristics. We used current-clamp method to record the action potentials of hippocampal CA1 pyramidal neurons held at 0 pA and elicited the action potential by current injection for 1 s. Hippocampal CA1 pyramidal neurons, which were recorded with an EPC-10 amplifier (HEKA Instruments), usually exhibited spike frequency adaptation in response to a depolarizing current pulse in whole-cell current-clamp recordings, as shown in Figure 3D, which is a common characteristic of pyramidal neurons [53, 54]. Patch clamp electrodes with resistances of 4-6 MΩ were made by a horizontal puller (Model P-97, Suttter Instruments), and they were filled with the pipette solution containing (mM): Gluconatic acid 125, TEACl 10, CsOH 125, MgCl2 2, NaCl 8, HEPES 10, EGTA 0.2, Na2ATP 3, Na2GTP 0.3 (PH 7.2). Currents were digitally sampled at 100 μs (10 kHz) and filtered at 2.9 kHz by a Bessel filter. The layer II/III hippocampal CA1 pyramidal neurons in acute hippocampal slices (300 μm thick) were held at -60 mV, at which holding potential, the membrane patch was most stable in the present experimental conditions. 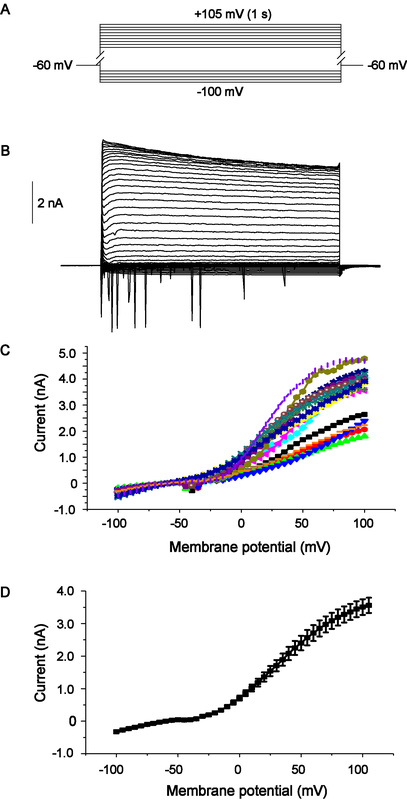 The average resting membrane potential was -65 ± 8.6 mV (mean ± SD, n = 105 cells), with the average input resistance of 117.3 ± 28.5 MΩ (mean ± SD, n = 93 cells). The input resistance of the cell membrane was derived by calculating the reciprocal of the slope of the I-V curve at the zero-current potential (Figure 4). 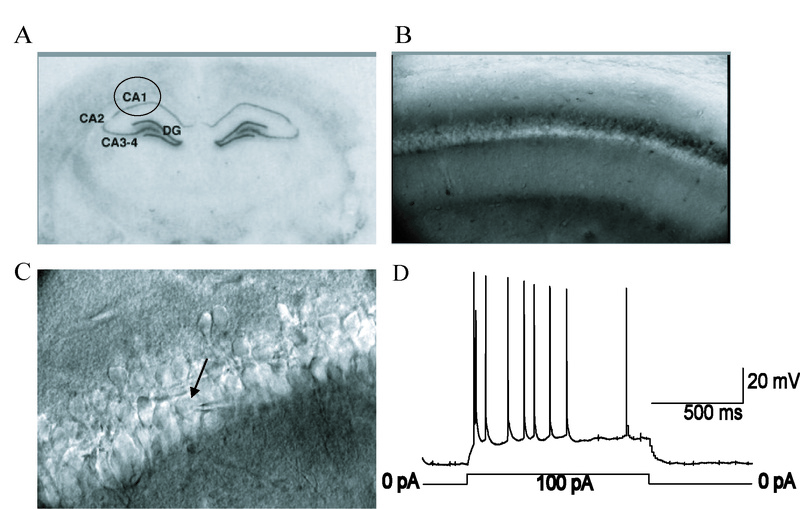 To isolate Ip in hippocampal CA1 pyramidal neurons during stable recordings, Str (0.5 mM) was used to inhibit the Na+/K+ pump, and an inward move of holding current generated. To detect the effect of 5-HT on Ip, 5-HT was given for 3-4 min, then Str was co-applied with 5-HT, and the produced inward current was contrasted with the control Ip of Str . The location visualization and electrophysiological characteristics of rat hippocampal CA1 pyramidal neurons. A. Schematic representation of the location of the hippocampal CA1 slice. B. The hippocampal CA1 location as visualized with ×10 infrared video microscopy. C. The hippocampal CA1 pyramidal neurons as visualized with ×40 water immersion lens of infrared video microscopy. Patch pipette is visible during whole-cell recording from the recorded neuron on right. 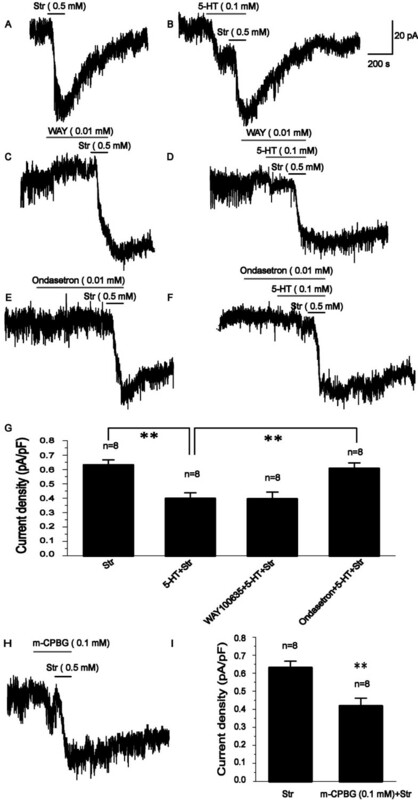 D. Action potentials of the hippocampal CA1 pyramidal neuron during a depolarizing current pulse from the resting potential of -60 mV. Note the spike frequency adaptation. The whole cell recording under the current clamp method was used. 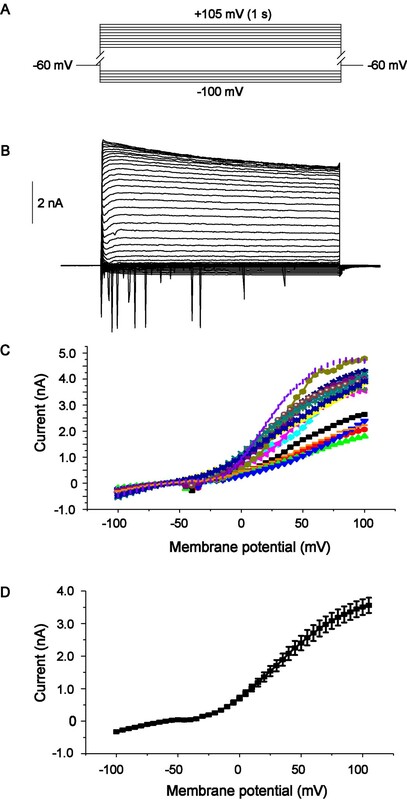 The amplitude and the time of injected currents were shown on top of membrane potential trace. I-V curve of recorded neurons. 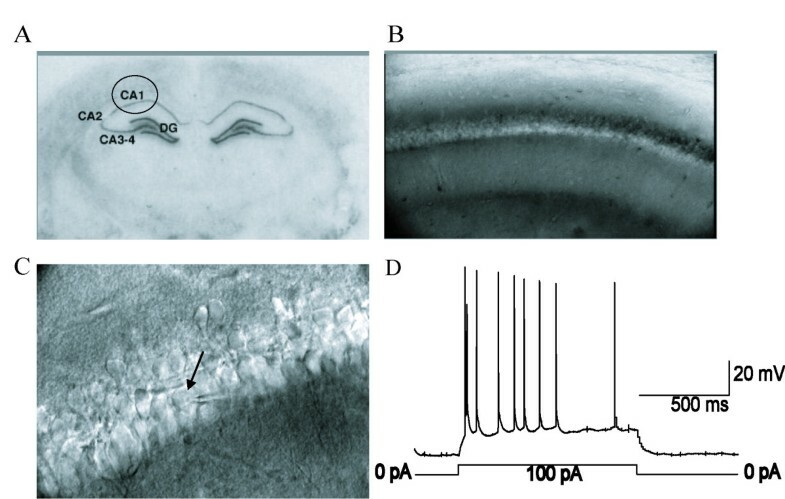 A, Schematic representation of the protocol of the recorded neurons; B, Representative current traces recorded from a typical hippocampal CA1 pyramidal neuron. Cell was held at -60 mV and stepped from -100 mV to +105 mV in 5 mV interval for 1-s duration, followed by a step to -60 mV once. C and D, I-V plots were constructed from the values of traces. Results were expressed as the mean ± S.E.M., and n indicated the number of slices studied. Statistical comparisons were made using the Student's t-test for unpaired samples, and significant differences were defined as having a P-value less than 0.05. This project was supported by the Natural Science Foundation of Hebei Province of China (No 301360). LNZ, SWS, FG and YLW conceived and designed the study. LNZ, HCG, XLS and YLW coordinated and performed the experiments. LNZ, XL and WYL performed data analysis. LNZ and YLW interpreted the results and wrote the paper. All authors read and approved the final manuscript.